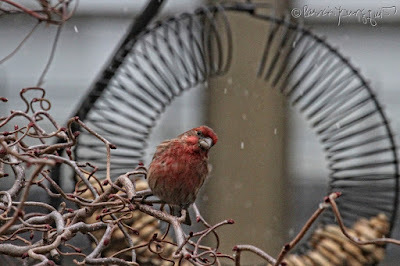 The Last Leaf Gardener: Let them eat snow! 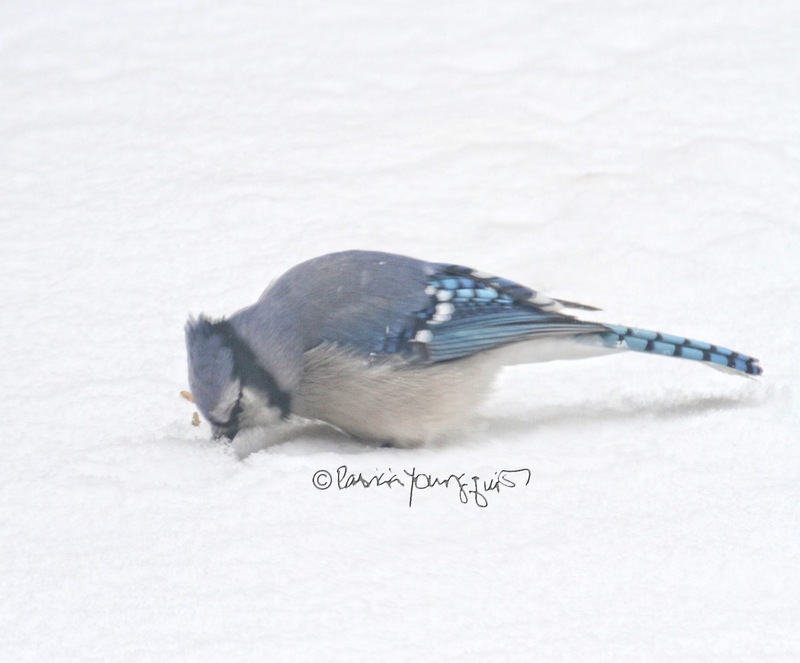 It is the last day of 2017, and I really should be shredding documents as well as personal letters that are no longer relevant to me, but for now, I'm composing my third entry for this day. 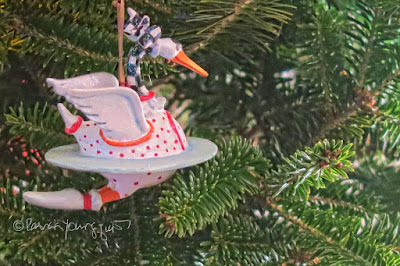 In my previous post for today, I mentioned that "it's only the seventh day of Christmas," which means it is the day when someone's true love gave to them seven swans a swimming, six geese a laying, five golden rings, four calling birds, three French hens, two turtle doves, and a partridge in a pear tree. 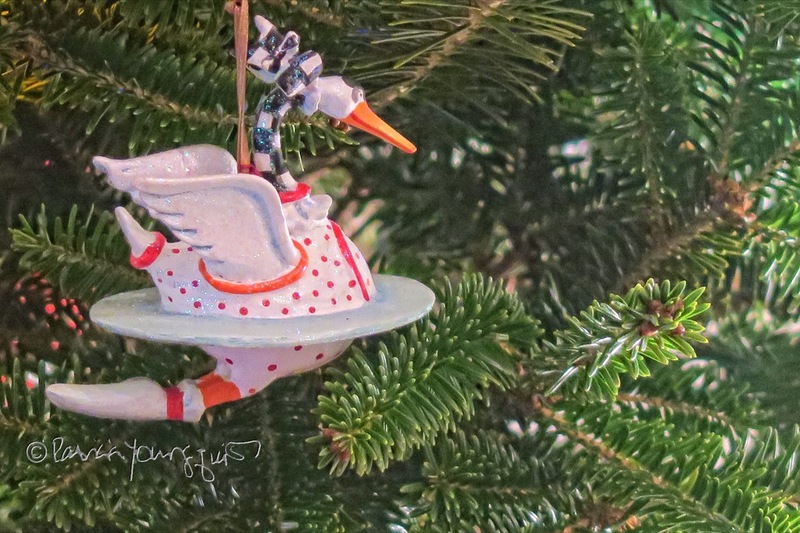 Now, in honor of the occasion of someone giving their true love seven swans a swimming, I've posted an image of my swan-themed ornament atop this entry. 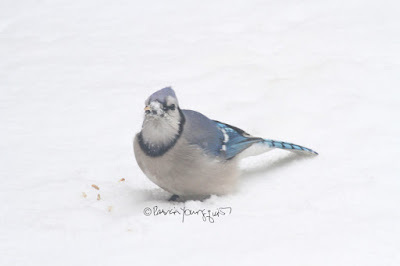 You might recognize her as she was featured in a 2016 posting here on Blogger. 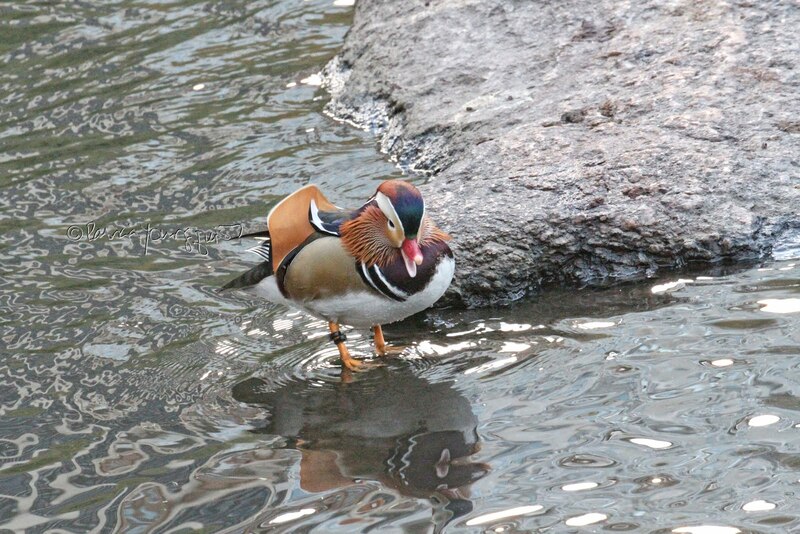 However, at this time, I don't think they'll be many swans a swimming in many parts of the USA, as it is very cold in a number of parts of this county, so places they'd be swimming are frozen; and NYC, is hardly an exception! Having water sources frozen is truly problematic for members of the avian community. 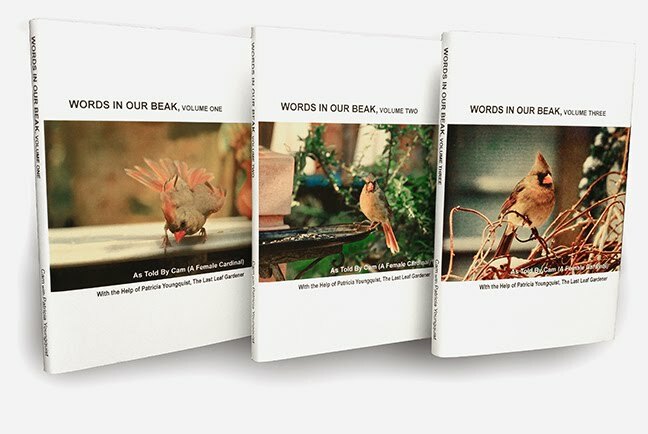 A web-page explains, "Birds need water every day, even when all the water is frozen." 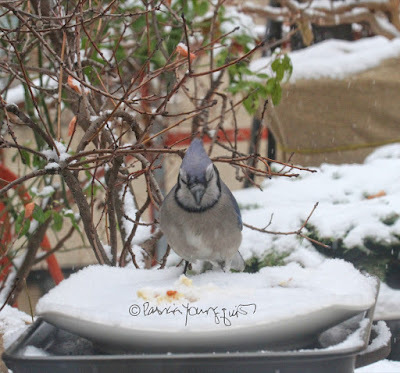 I have a few bird baths in my rooftop garden, however, they are not electrical, therefore when severe winter conditions strike, the water freezes. 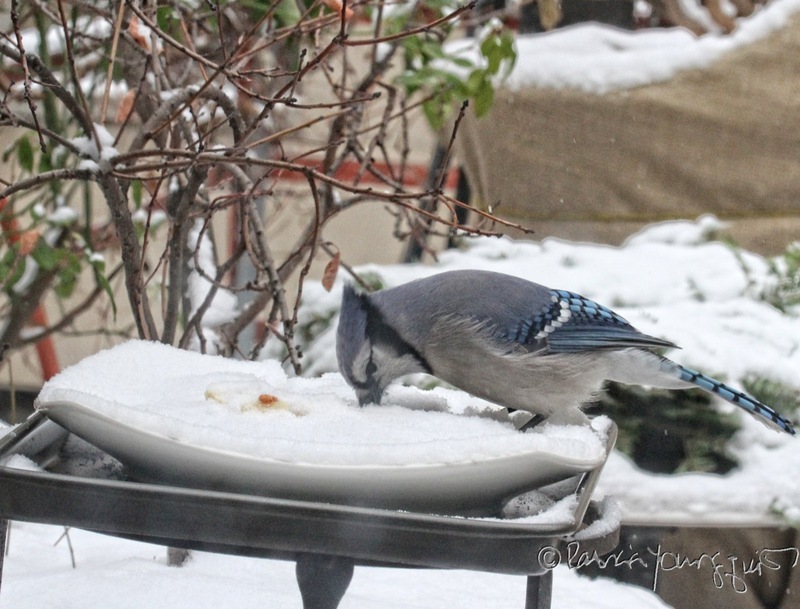 When this happens, I boil water in pans, take it outside, and pour it over the frozen bird baths until the ice melts. 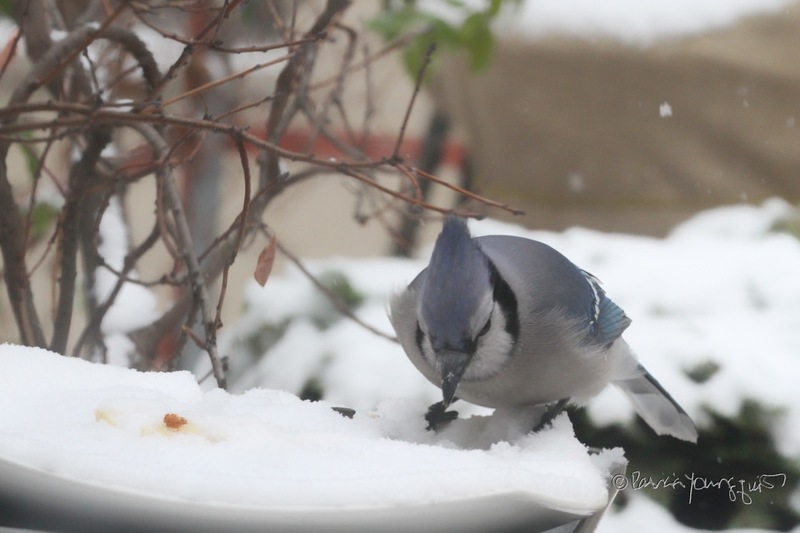 The aforementioned web-page acknowledges that birds can get water they need from "snow or food such as insects and wild fruits." 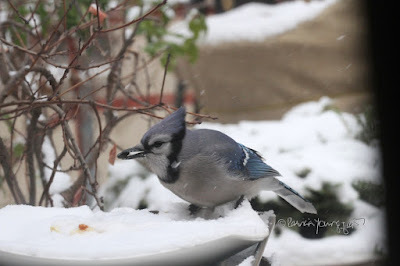 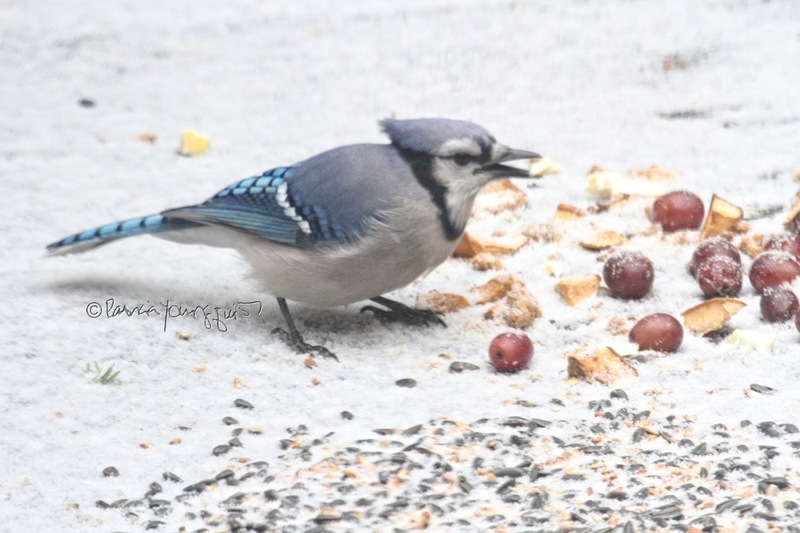 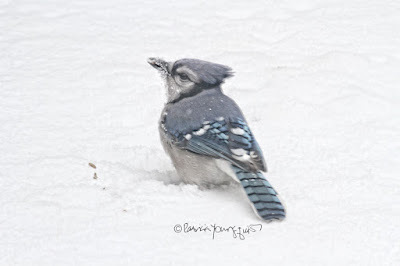 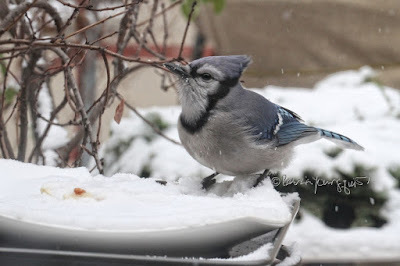 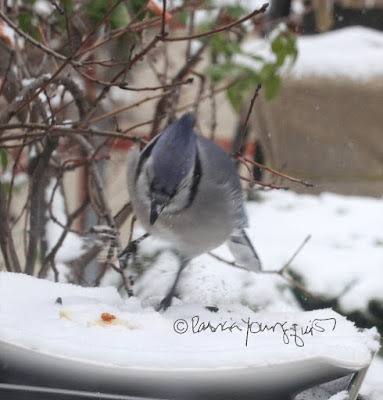 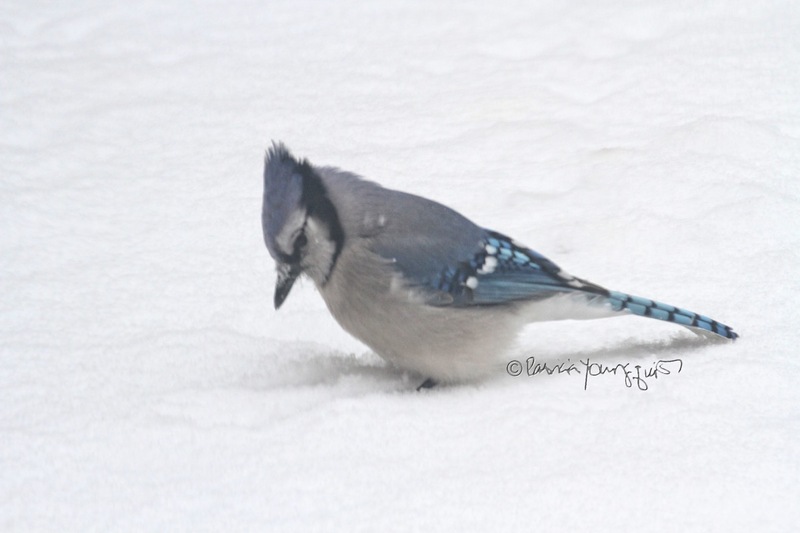 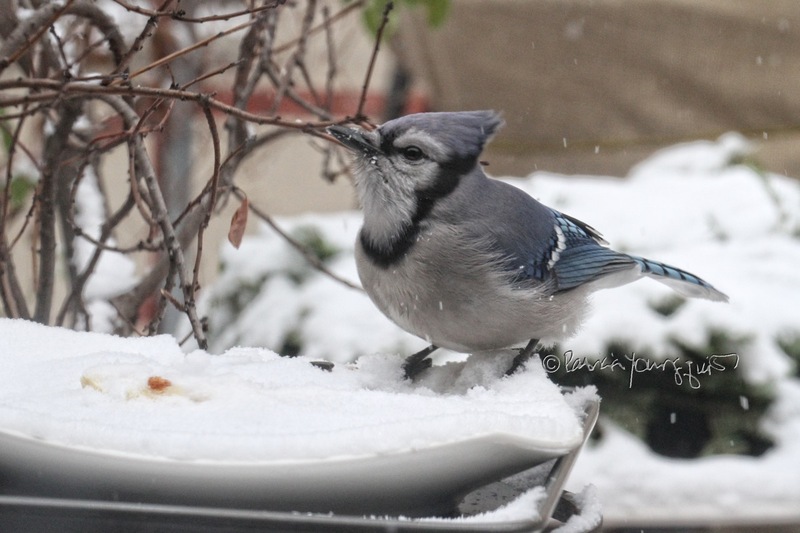 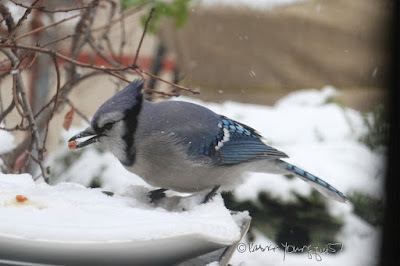 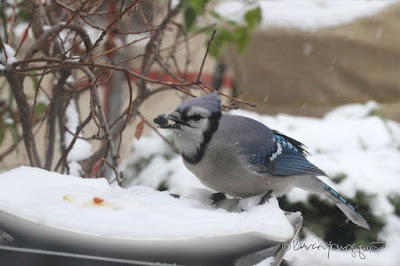 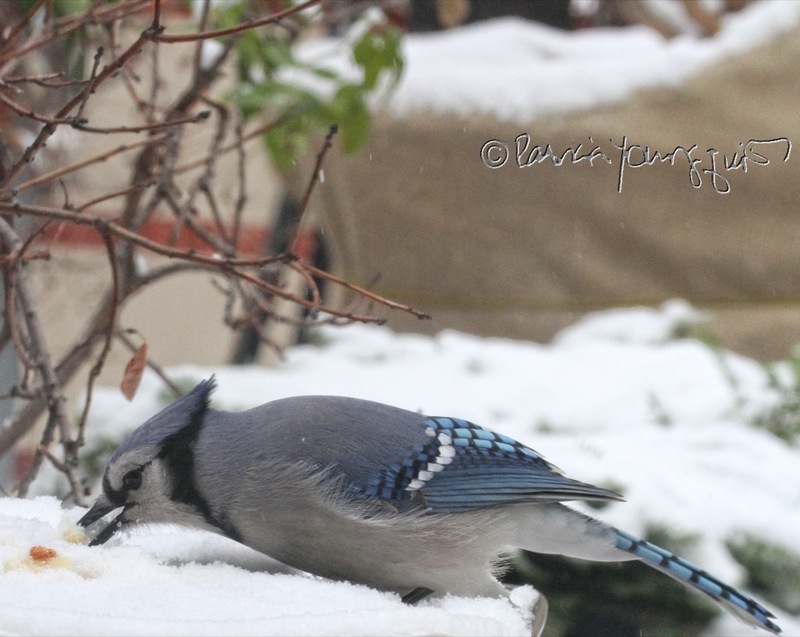 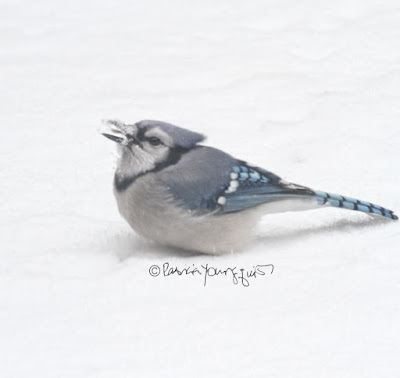 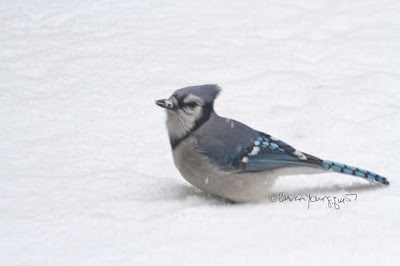 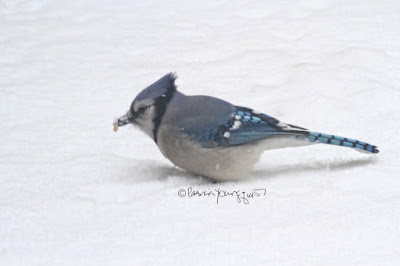 And yesterday, since it was impossible to keep up with unthawing my bird baths, due to the severe conditions, I noticed a visiting blue jay getting his/her water by noshing on snow-covered black-oil sunflower seeds, snow-covered insect-suet, snow-covered fruits; and just plain snow. All of this is evidenced in the next set of pictures, and in the first one of the series, it appears that the jay is saying grace before dining. And he/she did not seem to mind eating food covered with snow. 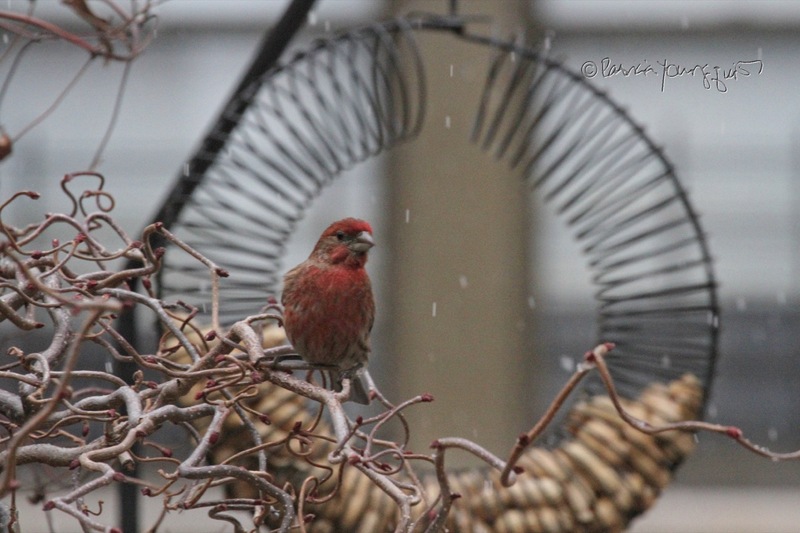 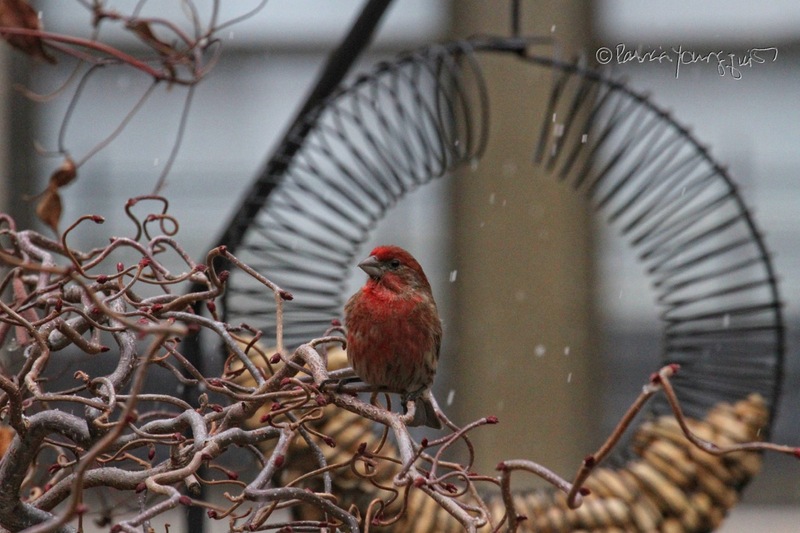 Normally, blue jays that visit me monopolize my wreath-style bird feeder, but yesterday, since they needed to eat snow, a lone male house finch had a rare opportunity to enjoy it as seen below. 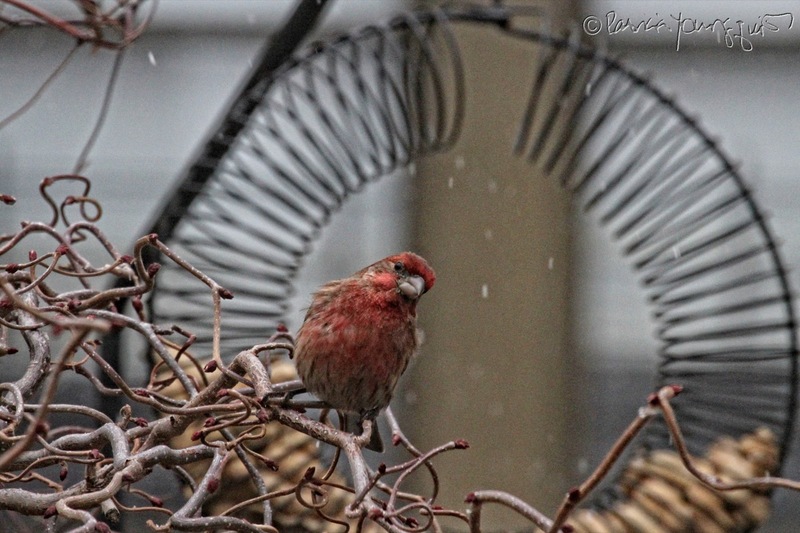 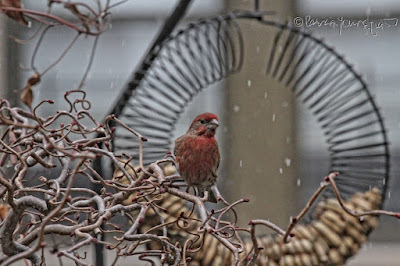 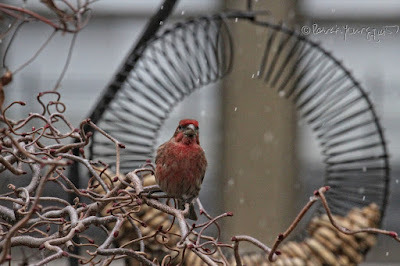 I'm not sure where the house finch was able to get water, but when it came to him being able to enjoy the wreath-style feeder without being harassed by jays, all he could say was, "Let them eat snow!"